Includes: Game console, chess/checkers/backgammon table board, (3) 2-sided interchangeable game boards, all accessories. 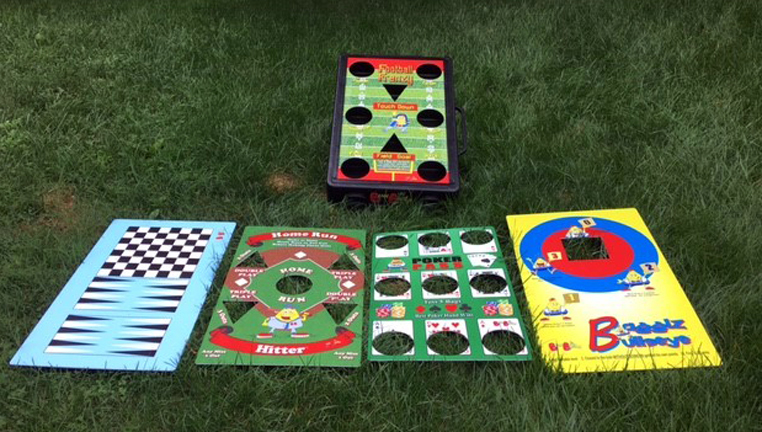 Your game board is large enough for 4 players can play two games at the same time. The game board is divided into two sections. One half is perfect to play Chess or Checkers. The other half is designed for Backgammon. Are you ready for some football? Now you can play Football Frenzy while tailgating with your buddies before the big game. Each player receives 4 bags which represent your 4 downs. Choose Solids or Stripes.- Toss until you miss or land in one of the Scratch Triangles. If you scratch, remove one of your legally pocketed balls. Booo! A great option for Fall Festivals and Halloween Parties. Players toss beanbags simultaneously. Go faster or slow down your opponent. First skier back to the dock wins. Every game consists of three periods, with each player tossing 5 bean bags per period. Explore the galaxy with BeanBagglz. First astronaut to 33 “out of this world” points wins. It’s like Tic-Tac-Toe with Beanbags. A friendly gambling game to play with your buddies. Are you a Goofy Golfer? Design and play 18 holes...player with the lowest score wins. How many homeruns can you hit before you make 3 outs? Play one of your favorite basketball games “Around-the-World” without a basket. When you miss, you can “chance it” which means you can then shoot again. But if you miss a second time, go back to the start. When your opponent makes a basket, once per game you can force him to “prove it” by making him shoot again. Players each receive 7 bags and alternate tosses knocking down the outer web in any order, then your turn ends. Be the first diver to possess all four treasures - a fun and fascinating game of strategy.